We all know we should keep fit – that we should do 30 minutes exercise three times a week. Or should that be two and a half hours in total? There’s so many messages on social media, articles in the papers, segments in the news, leaflets sent home by well-meaning doctors. 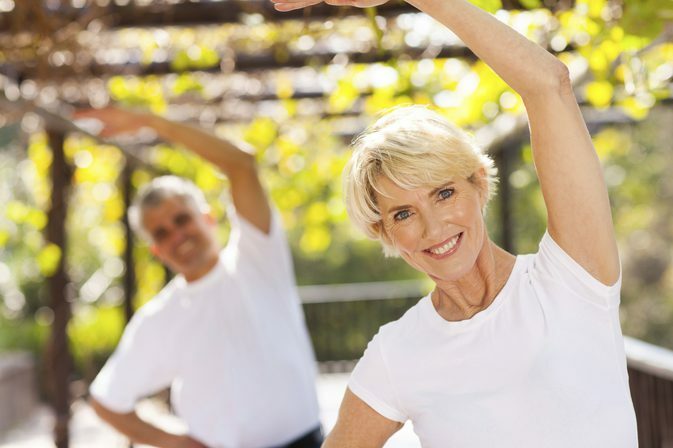 But have you ever actually wondered why it’s important to keep fit – especially in later life? Even if you can only manage a gentle daily walk it has been shown that exercise improves your mood and can help to prevent or manage depression. Getting out in the sunshine, when in season, and taking a stroll to “Blow away the cobwebs” is as important in your seventies as it was when you were seven. If you are fortunate enough to have live in care then they can help you to motivate yourself for a walk and accompany you on your way. As you get older your muscles don’t work as well as they used to. Which means that the risk of tripping or stumbling increases with age. And as you get older you don’t bounce as easily as you used to. Falls are the top reason that people over retirement age are taken to hospital – especially if they don’t have home care services to keep an eye on them. Keeping yourself active is a simple way to reverse the risk. Taking a daily stroll or a specialist low-impact fitness class can improve your muscle tone and reduce the risk of taking a tumble. Another muscle that starts to notice the strain of a lifetime is your heart. Waking it up from time to time, by going for a walk or swimming, and increasing your heart rate even a little can improve it’s health immensely. Having a healthy heart makes it less likely to fail and reduces the risk of complications such as high blood pressure and diabetes that can make your twilight years miserable. As we age our metabolisms slow down. Slower metabolisms make it easier to overeat and we all know that the result of overeating is being overweight. Not only is carrying too much weight a risk factor in diseases such as diabetes and heart disease it also makes it harder to keep mobile as the effort required to move is greater. Thus, if you allow yourself to become sedentary you enter a vicious cycle where in order to keep moving you need to lose weight and in order to lose weight you need to get moving. Keeping active in the first place is key to avoiding this downward spiral. Perhaps the most important reason to keep yourself active in later years is to allow you to continue interacting meaningfully with your grandchildren. Small children find it hard to understand why you can’t play football or catch or even just walk to the park to watch them on the swings. And do you want to miss out on those opportunities?